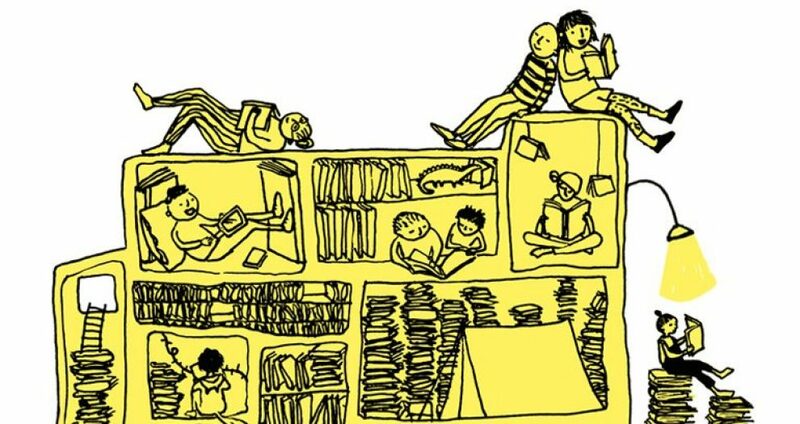 The Living Library, 9-12 May 2018 at the Omnibus Theatre in Clapham. A ‘library’ of varied performance spaces, all relating to how vitally libraries and reading shape our lives. The material came from the oral histories created with reading group members about what they remembered and valued about reading. One of the key themes is the importance of libraries as unique cultural and social spaces, offering ‘comfort, discovery, self-definition and salvation.’ To get the messages out there, the text and audio material provided the basis for all the pieces, all in different forms, to give people a variety of theatre experiences (storytelling, monologues, video pieces, etc), like books with different genres. Produced by Laura Bridges, as part of the theatre’s storytelling festival. As an old library, the Omnibus Theatre was the perfect space for it! Shafquat Towheed, ‘Synchronous vs. remembered reading: evidence from the UK Reading Experience Database, 1450-1945 (UK RED)’, 18 February 2015: podcast available here. Outline: With over 31,000 records, the UK Reading Experience Database, 1450-1945 (UK RED) is the world’s largest single dedicated repository of the experiences of readers in the past. It catalogues the experiences of British readers at home and abroad (and visitors to Britain) over five centuries. Within the database there is considerable recoverable information about when a reading experience and also when it was recorded. While much evidence of reading is recorded at the time or soon after, significant sources rich in evidence of reading (such as memoirs, edited travel journals and autobiographies) are by their very nature, retrospective accounts of remembered reading. This talk is in two parts: the first half explains how members of the Reading Experience Database team gather data, how we structure and record a ‘reading experience’, and how it is displayed. Specifically, I will be focussing on the ‘when’ of reading: when did the reading take place and how can we capture, record and display this? The second half of my talk looks at some of the methodological and interpretative issues around remembered reading vs. reading that’s recorded at the time or immediately after. We have the full spread of reading evidences in UK RED – from synchronous records of reading at the time they were taking place, to reminiscences of childhood reading many years later, but we have never scrutinized or categorised this chronological variances in records – or whether indeed, they should be thought of as two different types of evidence/reading experience. Pulling out some examples from the project, I will ask whether reading at the time and remembered reading are distinct evidential categories, requiring their own tools for investigation and analysis. NB. This seminar had to be cancelled: Kate Briggs, ‘And This Is What We Call By the Book’s Name’. Outline: Lecturing on the novel in 1979 at the Collège de France, Roland Barthes noted: we turn our books into pieces of lace. Reading is both the means of activating and experiencing a book and, at the same time, the means by which we turn it into something else. In this talk writer and translator Kate Briggs will discuss an ongoing research project which explores and attempts to find ways of articulating this difference between the book “itself” and what, when thinking or speaking of the it after the fact, we call by the book’s name. She will point to how a handful of writers, literary critics and theorists have identified and wondered about this problem: Robert Louis Stevenson, Percy Lubbock, Vladimir Nabokov, Roland Barthes, Nicholson Baker. She will then describe the workshop she led with readers in Leeds College of Art Library in May 2014 and the work she has produced as a result. Gill Partington, ‘Taking it literally: Mae Brussell and the misreading of fiction’, 11 March 2015, podcast available here. Outline: On 16th March 1979 the radio talk show host Mae Brussell recounted reading a book whose contents provoked a violent, visceral reaction, making her nauseous and faint. ‘I had the shakes for about a week’, she reported. The book in question was Alternative 3, an exposé of a sinister global plot at the highest levels. It was also, however, a spoof: a work of fiction, whose contents she misrecognised and quoted to her listeners as factual information. During the 1970s and 80s, Brussell’s radio broadcasts were required listening for conspiracy theory believers across America and beyond. They contained many such accounts of revelatory reading experiences, notable not only for their apocalyptic register, but also for their fundamental and often wilful misreading of fiction and hoax as factual material. This talk examines her retrospective accounts of reading, concentrating on how her interpretations of Alternative 3 and other texts negotiate a complex and shifting boundary between fiction and non-fiction. While her interpretative strategies may be easy to dismiss as just plain wrong, such aberrations reveal much about how the norms of reading function in the first place. Distinguishing between fact and fiction may be the most fundamental stage in deriving meaning from a text, yet it is also a distinction that seems so routine and self-evident that we give it little thought. Brussell’s idiosyncratic reading practices reveal something of its complex workings, however, concentrating not only on content but on context, and on the material circumstances in which books are encountered. Her discussions throw a new light on the kinds of paratextual and contextual information which sets our interpretative parameters as readers. “She used to get lost in a book”: Approaching gendered reading through two archives (Memories of Fiction and 100 Families), Amy Tooth Murphy and Shelley Trower, 5 November 2015 at Senate House, London. For more information click here. 11 November 2015 at 4pm, Bournemouth University Narrative Research Group. Title and speakers as above.